Finally the re-issue (for the third time in ten years if my memory serves correct) of the hard to find Wild Pitch classic now in a special digipak! Word...Life is one of those slept on albums from the early 90's that was often compared to Nas' Illmatic, and slowly became a sought after favorite amongst hip hop fans everywhere. Produced almost entirely by D.I.T.C staple Buckwild, and receiving a huge push from already majorly respected names and contributors Lord Finesse and Organized Konfusion, the album featured solid production and the Queens mc's sophisticated flow and storytelling rhymes throughout. 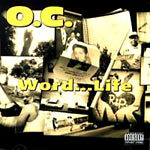 Popular jams off of this album include ''Times Up'' and ''Born to Live'' to name a few. You wanna complete your collection...this is just one of many pieces to that puzzle!